Home "Conflicts of interests" What is business ethics for? A new semester, and a new class of business ethics, has begun. In my class, we initially discuss concrete examples of ethical dilemmas in business before delving into the main moral codes and the values and principles they comprise, to learn how they provide guidance to real-life decision making. Students come up with a variety of examples of dilemmas, some of which reflect their concern for environmental sustainability of business or for social justice: carbon emissions from business operations, paying “living” wages versus market wages, or hiring based on “diversity” as opposed to merit, for example. I then present different views of the purpose of business ethics. The first is the prevalent view that business ethics is needed to temper the profit motive—“greed”—with environmental and social responsibility. This view pits business owners’ goal of profit maximization against those of others: customers (good value for their money), employees (fair wages), environmentalists (nature untouched by humans), and social justice advocates (wealth ‘redistribution’). My sense is that this view initially resonates most with the students. After all, they have been exposed to it all their lives, for many of them starting at home, but at the latest at school, and through the media. This view is also endorsed and encouraged at business schools in general. The second view of the purpose of business ethics counters the first, rejecting the idea of sacrificing profits for the sake of helping others or the environment. According to this view, business ethics is for ‘wimps:’ business is a ruthless game with no room for considering others, as only the fittest survive, and profits must achieved through any means, including cheating and faking. This view is sometimes expressed by some MBA students who say that ethics is nice if you can afford them, but in competitive markets they are too costly, particularly when everyone else is cutting corners. The third view regards business ethics as a guide to long-term profitability. Like the first, this view also rejects sacrificing profits for the sake of helping others or for the environment. However, in this view, the profit motive does not need to be tempered—because there is no conflict between profit maximization and acting ethically, properly understood. These views on the role of business ethics rest on different moral codes which we then study through the rest of the course, applying them to business decisions. The first view is based on the moral code of altruism, which, contrary to common belief, does not mean benevolence and kindness but requires putting others’ needs always ahead of one’s own instead. In other words, it requires self-sacrifice and not the selfish pursuit of profits, for which businesses must atone by giving at least part of the profits away for those who ‘need’ them more, such as those less knowledgeable and skilled, and therefore less able to be productive. The second view is based on the moral code of cynical exploitation, which advocates subjective ethics based on each individual’s whims, with the motto “do onto others before they do to you.” Cynical exploitation rejects self-sacrifice as untenable. Instead of sacrificing oneself to others, it advises sacrificing others to oneself when needed to achieve what one wants, and endorses initiation of physical force (stealing proprietary information, say) and fraud (for example, falsifying financial information to lure investors or to obtain loans). This moral code necessarily focuses on pursuing short-term whims, as profits obtained by force or fraud are not sustainable in the long term. 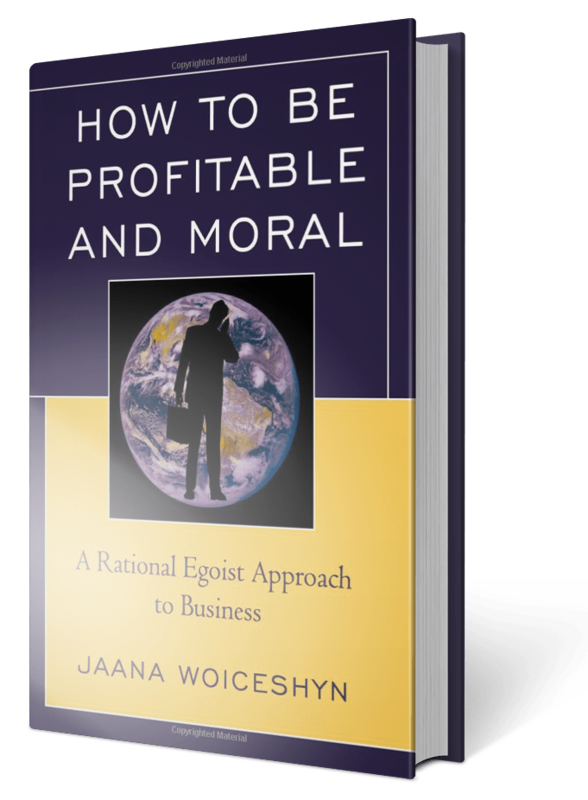 The third view, ethics as the guide to long-term profitability, is based on the moral code of egoism. Like cynical exploitation, it rejects self-sacrifice as untenable, but equally and for the same reason, it rejects sacrificing others to oneself. Businesses producing and trading material values—food, energy, cars, insurance policies, smart phones, life-saving drugs—cannot maximize profits in the long-term by sacrificing them for the sake of others, or by sacrificing others by initiating force or fraud. The former is obvious. The latter would lead to legal sanctions but also to loss of reputation and business when customers, employees, and investors flee, and the business would run out of victims. As we uncover the logic and principles of each moral code in the class, the students are able to conclude that only the third moral code, egoism—which rejects all forms of sacrifice and advocates voluntary trade instead—facilitates win-win outcomes, helping maximize profits for business and prosperity and flourishing for all. That is what business ethics is for. Next articleDoes fighting climate change give business an advantage?